Ludwig van Beethoven (baptized December 17 1770, died March 26 1827) was a German composer and pianist who lived predominantly in Vienna, Austria. A crucial figure in the transition between the Classical and Romantic eras in Western art music, he remains one of the most famous and influential of all composers. Letter to F.G. Wegeler, 16 November, 1801. There ought to be but one large art warehouse in the world, to which the artist could carry his art-works, and from which he could carry away whatever he needed. As it is, one must be half a tradesman. Muß es sein? Es muß sein. Must it be? It must be. Epigraph to string quartet in F Major, Opus 135. Musik höhere Offenbarung ist als alle Weisheit und Philosophie. As reported by Bettina von Arnim in a letter to Goethe, 28 May 1810. Goethe's Briefwechsel mit einem Kinde: Seinem Denkmal, Volume 2, Dümmler, 1835, p. 193. Music is indeed the mediator between the spiritual and sensual life. Do not merely practice your art, but force your way into its secrets; it deserves that, for only art and science can exalt man to divinity. Letter to Emilie, July 17, 1812. I met [Meyerbeer] at the performance of my "Battle." Most of the composers then in Vienna were kind enough to undertake something or other in my orchestra, and the young man played the big drum. Ha! ha! ha! (a peal of laughter). I had reason not to be very well satisfied with him. He was always behindhand, and I had to give it him roundly. (New peal of laughter.) He must have felt mortified by my observations; but there is no reliance to be placed in him; he has not the courage to raise his arm at the proper moment. One clashes with stupidity of all kinds. And then how much money must be spent in advance! The way in which artists are treated is really scandalous. I am compelled to give a third of my receipts to the manager of the theatre and a fifth to the hospitals. Devil take them! As long as these abuses exist, I shall always ask whether music is or is not an art that may be freely exercised. Believe me, there is nothing to be done for artists in times like these. It is a recognised fact that the greatest composers were likewise the greatest virtuosos; but did they play like the pianists of the present day, who run up and down the keyboard with passages studied beforehand? Pooh! pooh! pooh! Don't tell me! A real virtuoso, when extemporising, plays pieces which hold together and possess a form. Were the ideas in them fixed instantly on paper, they would be taken for pieces written at leisure. That is what I call playing the piano; everything else is a bad joke. The world is a king, and like a king, desires flattery in return for favor; but true art is selfish and perverse — it will not submit to the mold of flattery. Said on his deathbed, 1827, as cited from the book Last Words. "A meeting of minds", The Guardian, 18 November 2005. Whoever tells a lie is not pure of heart, and such a person can not cook a clean soup. Not found in Beethoven's known works. It may be a summary of the following description of Beethoven from his piano pupil Ferdinand Ries: "When I left out something in a passage, a note or a skip, which in many cases he wished to have specially emphasized, or struck a wrong key, he seldom said anything; yet when I was at fault with regard to the expression, the crescendo or matters of that kind, or in the character of the piece, he would grow angry. Mistakes of the other kind, he said were due to chance; but these last resulted from want of knowledge, feeling or attention. He himself often made mistakes of the first kind, even playing in public." As usual he submitted to the interminable entreaties and finally was dragged almost by force to the pianoforte by the ladies. Angrily he tears the second violin part of one of the Pleyel quartets from the music-stand where it still lay open, throws it upon the rack of the pianoforte, and begins to improvise. We had never heard him extemporize more brilliantly, with more originality or more grandly than on that evening. But throughout the entire improvisation there ran in the middle voices, like a thread, or cantus firmus, the insignificant notes, wholly insignificant in themselves, which he found on the page of the quartet, which by chance lay open on the music stand; on them he built up the most daring melodies and harmonies, in the most brilliant concert style. Old Pleyel could only give expression to his amazement by kissing his hands. After such improvisations Beethoven was wont to break out into a loud and satisfied laugh. His improvisation was most brilliant and striking. In whatever company he might chance to be, he knew how to produce such an effect upon every hearer that frequently not an eye remained dry, while many would break out into large sobs; for there was something wonderful in his expression in addition to the beauty and originality of his ideas and his spirited style of rendering them. After ending an improvisation of this kind he would burst into loud laughter and banter his hearers on the emotion he had caused in them. "You are fools!" he would say. Sometimes he would feel himself insulted by these indications of sympathy. "Who could live among such spoiled children?" he would cry, and only on that account (as he told me) he declined to accept an invitation which the King of Prussia gave him after one of the extempore performances above described. Another equally true saying of Schumann is that, compared with Beethoven, Schubert is as a woman to a man. For it must be confessed that one's attitudes towards him is almost always that of sympathy, attraction, and love, rarely that of embarrassment or fear. Here and there only, as in the Rosamund B minor Entr'acte, or the Finale of the 10th symphony, does he compel his listeners with an irrestistible power; and yet how different is this compulsion from the strong, fierce, merciless coercion, with which Beethoven forces you along, and bows and bends you to his will. Sir George Grove in his Beethoven, Schubert, Mendelssohn (London:Macmillan, 1951), p. 238. A brain scan may reveal the neural signs of depression, but a Beethoven symphony reveals what that depression feels like. Both perspectives are necessary if we are to fully grasp the nature of mind, yet they are rarely brought together. If the question [about if there were only one composer in the world I could play] is purely ‘original’ works, no transcriptions, then Beethoven. Beethoven did not always plumb the depths. He was not always busy with major problems and the most significant spiritual experiences. Such works, as the fourth, sixth, and eighth symphonies depict states of mind that require no such intensity of realization. It is significant that they were all written comparatively quickly... They are not in the main line of Beethoven's spiritual development. A colossus beyond the grasp of most mortals, with his totally uncompromising power, his unsensual and uningratiating way with music as with people. His ideas came so profusely that he always had several works going on at once, and he always meditated and thought over them for a long while before he brought them to completeness. His practice was to jot down the ideas roughly as they came into his head in little sketch-books which he carried in his pocket, and he then polished and improved these original ideas time after time, sometimes for years, before he worked them up into complete works. When his friends, says Czerny, speak to him of his youthful renown, he replies: "Ah, nonsense! I have never thought of writing for renown and glory. What I have in my heart must out; that is why I write." It was not an enjoyable experience. First of all the piano was dreadfully out of tune, which did not trouble Beethoven in the least, since he could not hear it. Little or nothing remained of the brilliant technique which had been so much admired. In loud passages the poor deaf man hammered away at the notes crashing through whole groups of them so that without the score one lost all sense of the melody. I was deeply moved by the tragedy of it all. 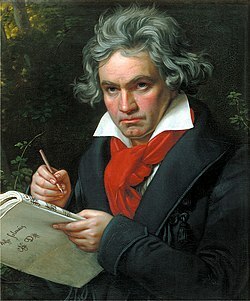 Beethoven's almost continual melancholy was no longer a mystery to me. Louis Spohr commenting on an invitation, in 1808, to attend a rehearsal by Beethoven of his D Major Piano Trio, Opus 70, no. 1. You are going to Vienna in fulfillment of your long-frustrated wishes. The Genius of Mozart is mourning and weeping over the death of her pupil. She has found a refuge but no occupation with the inexhaustible Haydn; through him she wishes to form a union with another. With the help of assiduous labor you shall receive Mozart's spirit from Haydn's hands. ↑ "When Beethoven gave me a lesson"
Für Elise - and other Beethoven resources. Immortal Beloved (film) - the film about Beethoven by Bernard Rose.